A single self-sown lettuce head (appropriately named Marvel of Four Seasons, I believe) among some buffalo grass speaks of the promise of plenty and abundance for the New Year. 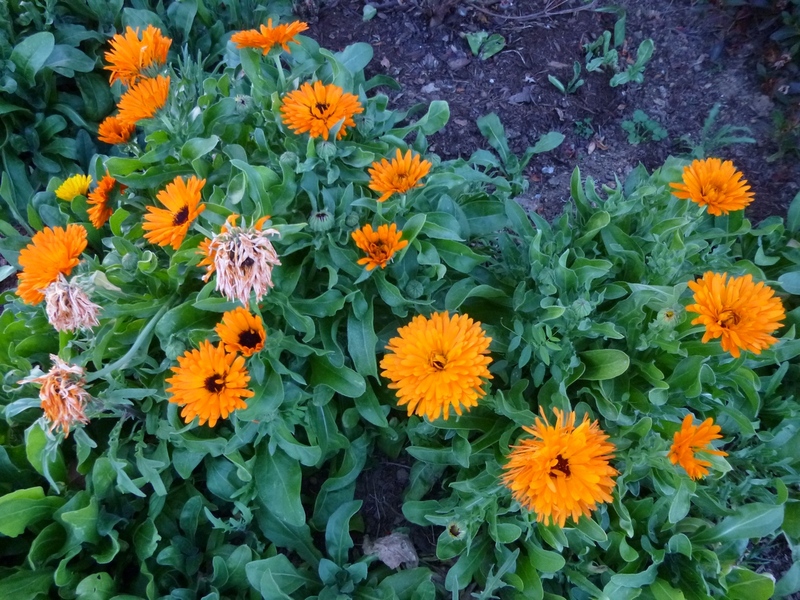 I would like to broaden my mind and expand the circle of blogs from which I glean gardening knowledge and inspiration. As you can see from the sidebar to the right, I've feel lucky to have found nearly 20 admirable gardening bloggers to follow. But I'm sure there must be other great garden bloggers out there around the country whose insights have been eluding me until now. So, Dear Reader, please spill the beans: Which garden bloggers would you recommend that I add to my blogroll and my "must read" list for the New Year? And speaking of that New Year, I hope it is one in which your germination rates are high, your weeds are few, your crops are fruitful and your pollinators abundant. In short, I hope that 2013 is a wonderful, peaceful and beautiful New Year for you all! 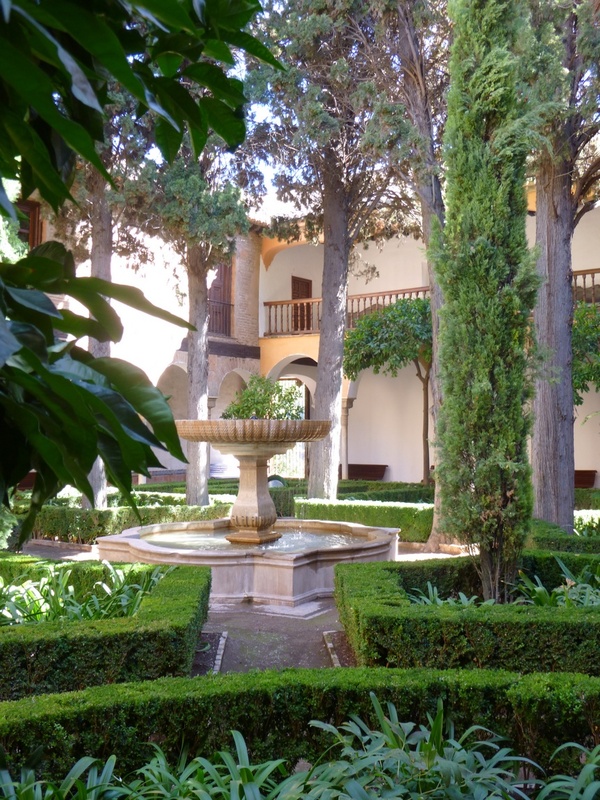 Courtyard garden in Sevilla's Alcazar palace. Beautifully carved archways and a pleasant-enough long pool of water, but I'm underwhelmed by the scrawny, clipped orange trees adrift in a sea of dirt. This courtyard does demonstrate the Moorish and Mudejar predilection for symmetry in design. To me, the Alhambra in Granada represents the pinnacle of Moorish architecture and design in Spain. 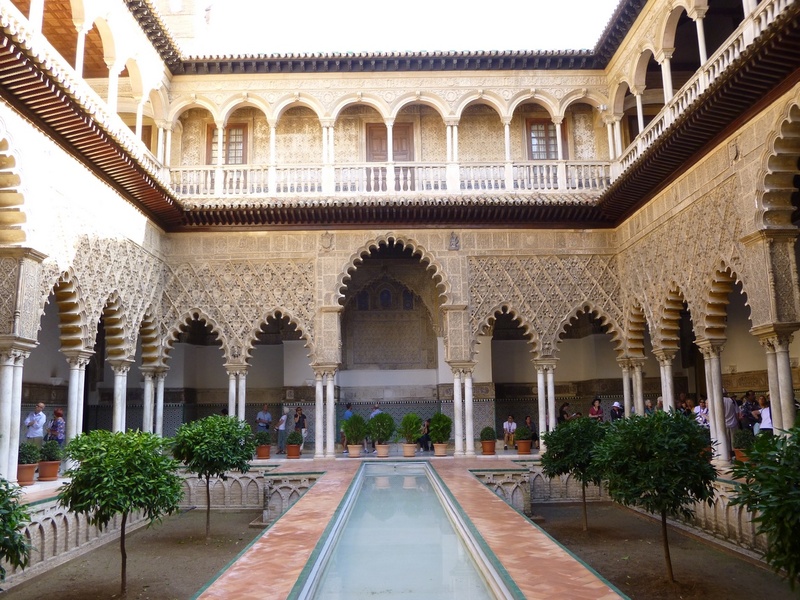 The Alcazar in Sevilla, on the other hand, demonstrates "Mudejar" craft -- the skill of Muslim artisans who remained in Spain after the Christian reconquest and used their skills (especially architecture and decorative arts) in the service of Christian monarchs and a Christian sensibility. 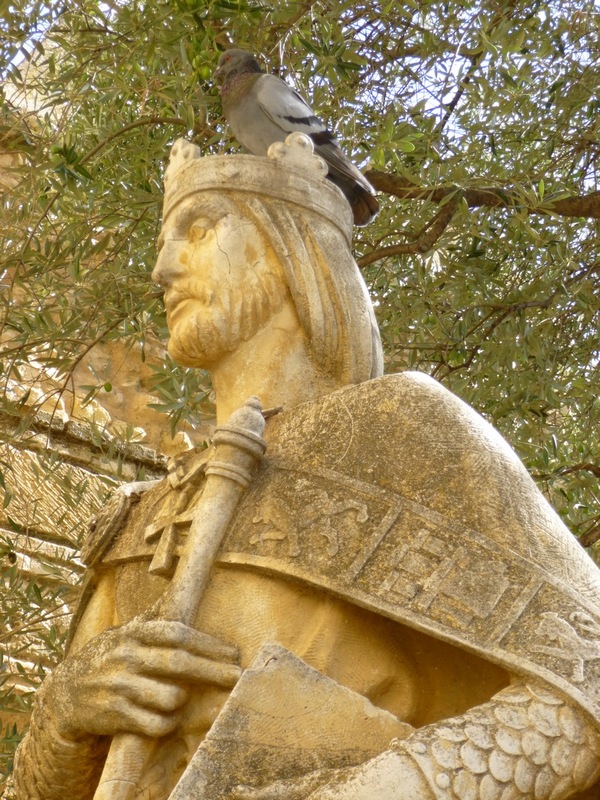 Thus, for instance, a building that was built for the Christian king Peter I apparently contains Arabic inscriptions that describe Peter as a "sultan". 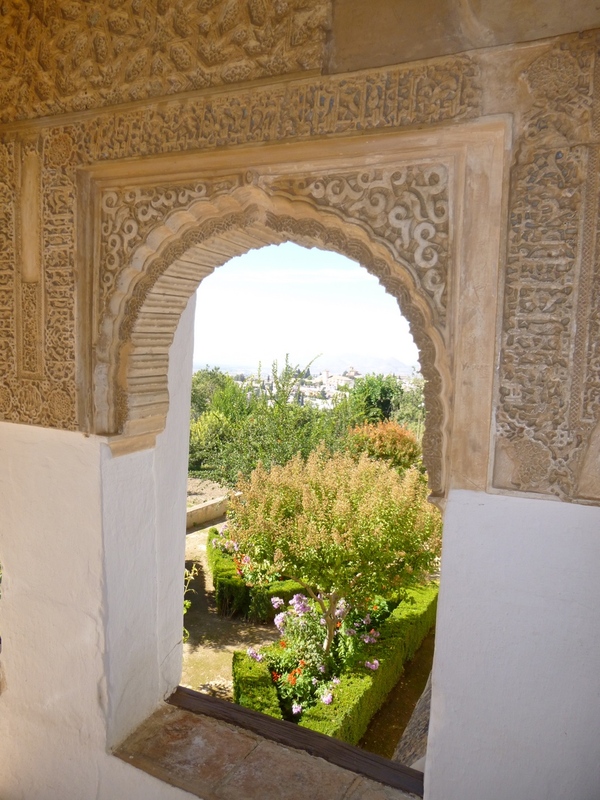 Personally, I prefer what I consider to be the pure Moorish aesthetic at the Alhambra. While I admire the fact that kings like Peter respected the Moorish traditions enough to incorporate their styles into his palace, the Sevilla Alcazar still seems somewhat ersatz to me. Lantana camara (popularly known just as Lantana) is treated as an annual plant where I live, but I was surprised to learn that it is actually a perennial hardy to zone 9b (according to Dave's Garden). 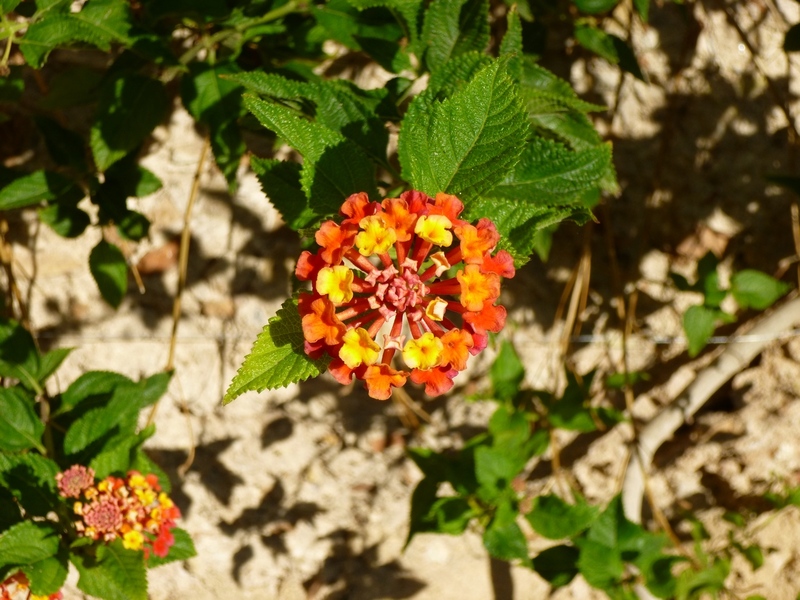 Southern Spain had the most beautiful Lantana plants that I had ever seen, including this specimen in the Alcazar gardens. According to North Carolina State University, unripe Lantana berries are extremely poisonous, so please be careful with this plant! There are also reports that the leaves can cause dermatitis in people (and can be poisonous to cattle that eat large quantities of them) and Lantana camara can apparently also be very invasive, especially in warmer parts of the U.S. So while I like this photo, I guess I would discourage post people from planting Lantana in their yards. Like what you've been reading? Stay up-to-date on future posts with an email subscription. 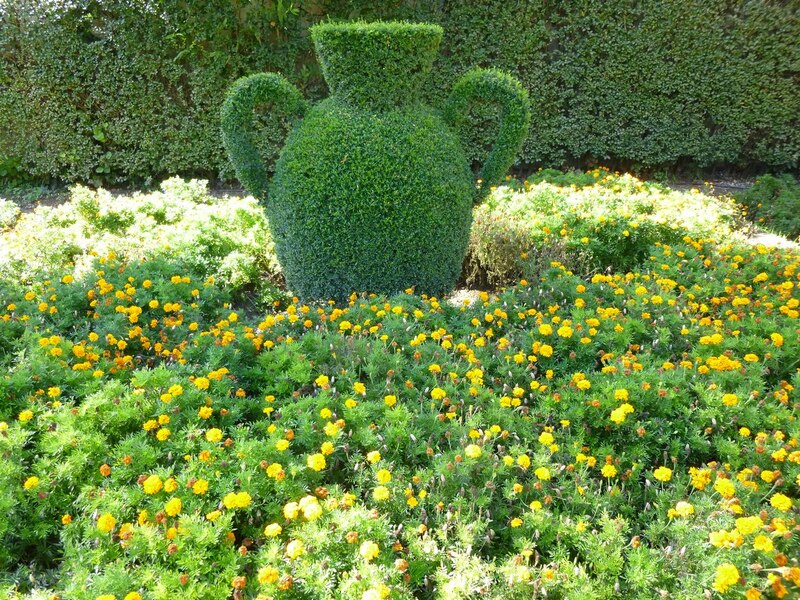 In honor of the holiday, I thought this might be a nice occasion for a festive tour through the gardens of Spain. 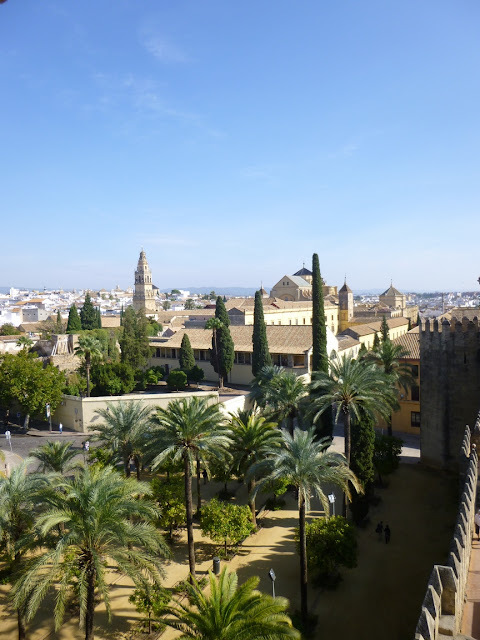 I had the privilege of visiting Spain earlier this autumn, specifically the cities of Barcelona, Sevilla, Cordoba, Madrid and Toledo. While I was there, I took a number of garden-related photos. 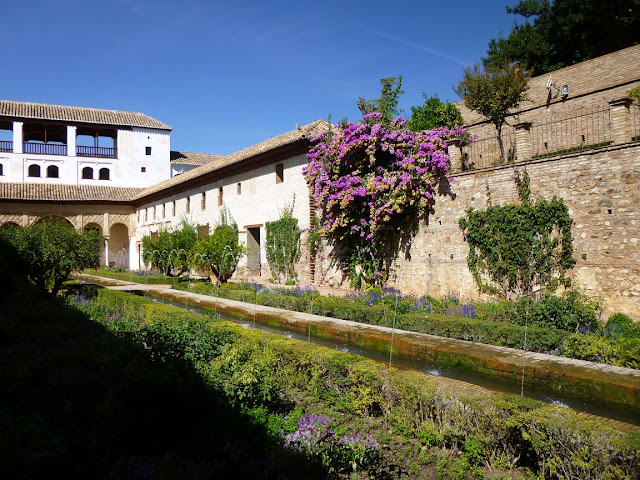 Let's start in Granada, where we spent a whole day at the remarkable Alhambra, a complex of palaces, villa, fortress and gardens built by the moors primarily from the 11th to 13th Centuries C.E. 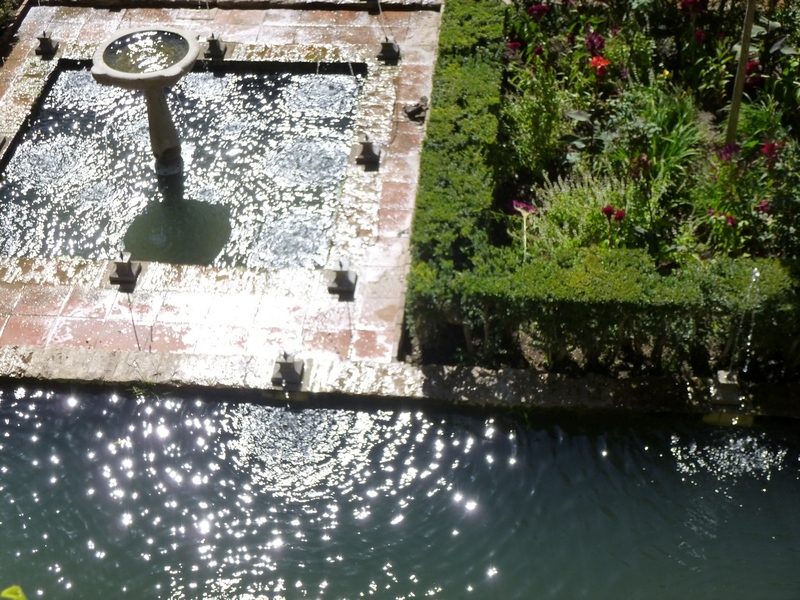 GardenVisit.com calls the Alhambra gardens "the best and most-famous late-medieval castle gardens in Europe." I have to admit - and this may be sacrilegious to late-medieval castle garden fans, but the Alhambra gardens did not actually appeal to me very much. In fact, to be honest, I found the famous Spanish gardens I visited to be a bit of a letdown in general. Too much in the way of endless hedges, not nearly enough in the way of color, flowers or horticultural diversity. Perhaps my expectations were too high. Perhaps Spanish gardening tastes are simply not in sync with my own. That said, you can't traipse around Spain for a couple of weeks without finding some photogenic garden sights. Here are a few of my favorites from the Alhambra. The interior of the Generalife palace within the Alhambra complex. I liked the way that the arch with its intricate carvings framed this garden view. Can anyone help with a plant ID here? The flowers (but not the leaves) look a little like Fatsia japonica. 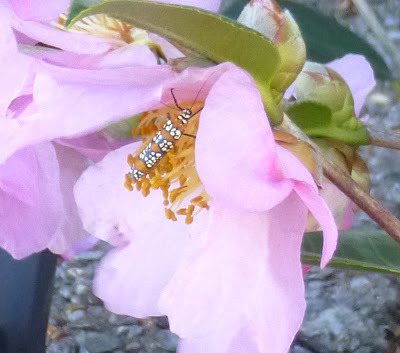 If this plant is hardy in zone 6/7, I'd be interested in adding such a pollinator-friendly plant to my garden. In October, when we visited, the Alhambra was highlighting Celosia (also known as Cockscomb) as its Plant of the Month. Fun fact -- according to Wikipedia, Celosia is actually related to amaranth. 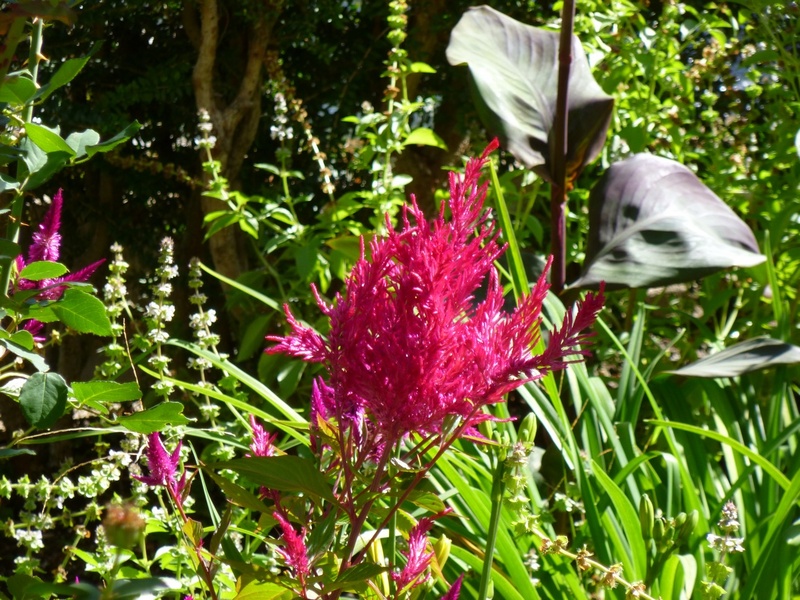 Wikipedia further claims that at least some varieties of Celosia may have medicinal or edible uses. I've been hesitate to grow celosia since I've heard the plant is somewhat temperamental (sensitive to root stress), but these claims make me want to take another look at a plant which clearly has some lovely ornamental appeal. If you've grown (or tried to eat) celosia, please share your experiences in the Comments section below. 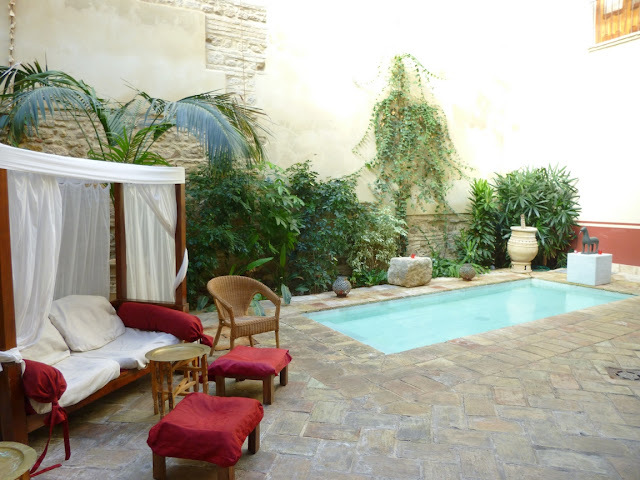 A courtyard garden with a pleasingly geometric water fountain. From what I have read, water is typically an important feature in Moorish gardens. Here you can see the ubiquitous low hedges seen in many Spanish gardens. Can't say they appeal to my aesthetic sensibilities (because they don't). It was really hard to get a photo with no people in it, as the Alhambra was mobbed with visitors. I like the massive purple vine (wisteria?) growing on the wall, as well as the blue flowers (sage?) growing alongside the wall. I can see how some people would like the long channel of water with the twee little arched fountains spritzing water along it, but again, it's not my cup of tea. You can also see here how many of the low hedges alongside the channel/fountain are in sad shape. This seems to be to a peril of relying on hedges for garden structure. If the hedge starts to decline, the impact on the garden aesthetics can be catastrophic, whereas the decline of a single plant (or even multiple plants) in a mixed shrub and perennial border can be managed far more gracefully and subtly. 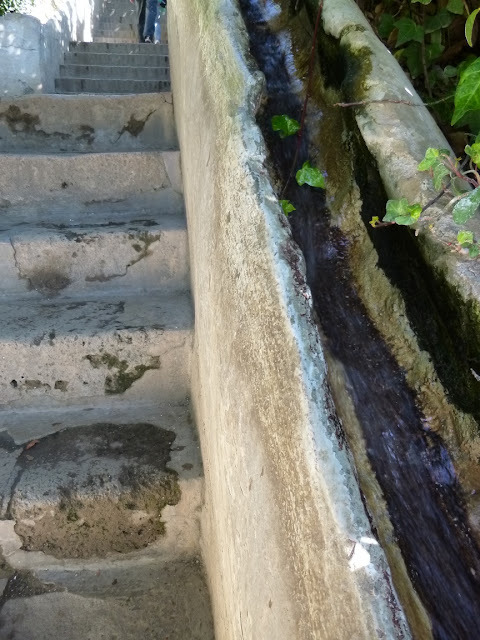 I'd never seen this before and have to say that I thought it was very clever for the designers to have carved a water channel alongside this stairway. In the hot climate of southern Spain, it makes climbing the stairs a more cool and refreshing experience. Not sure it would work so well in a colder climate where I might be worried about water splashing and freezing to create a slip hazard, but I suppose the waterworks could always be turned off in a colder season? I have to imagine that small animals (birds, lizards, etc.) would enjoy drinking and bathing in such a shallow stream of water. 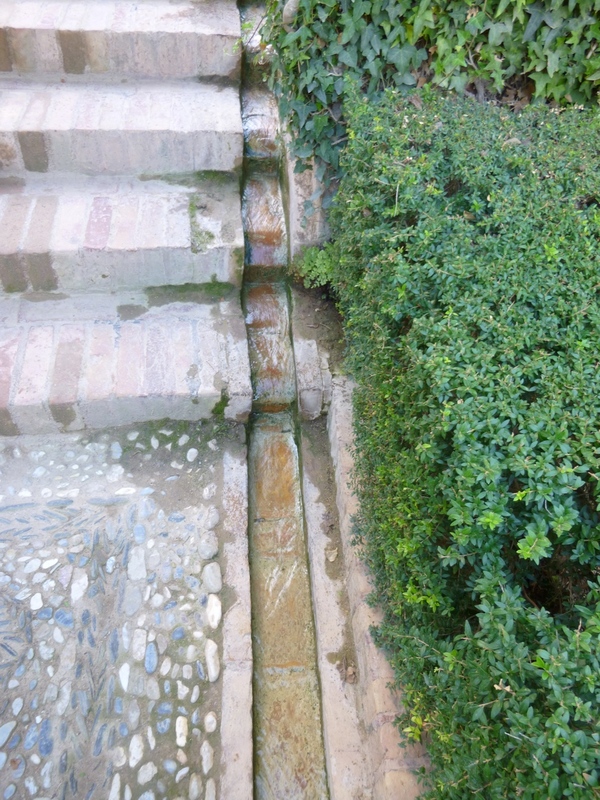 Here's a slightly different idea with a rushing stream actually carved into the handrail of the stairway. What an interesting concept! Again, water (and those danged hedges) play a major role in this garden, along with fountains and geometric shapes. Perhaps it's the linear geometry and right angles that I find so off-putting in the Moorish gardens? Perhaps that's what caught my in this photo where the sunlight draws curving ripples in the water that soften the hard lines of the garden framework and encourage the viewer to linger in order to listen to splashing of the water and be mesmerized by the sparkling and shimmering evanescent patterns. Want to stay in the loop? Never miss an update with a free email subscription to Garden of Aaron! The December Garden - Ajuga reptans "Black Scallop"
Solid, dependable and slowly spreading Ajuga reptans "Black Scallop". 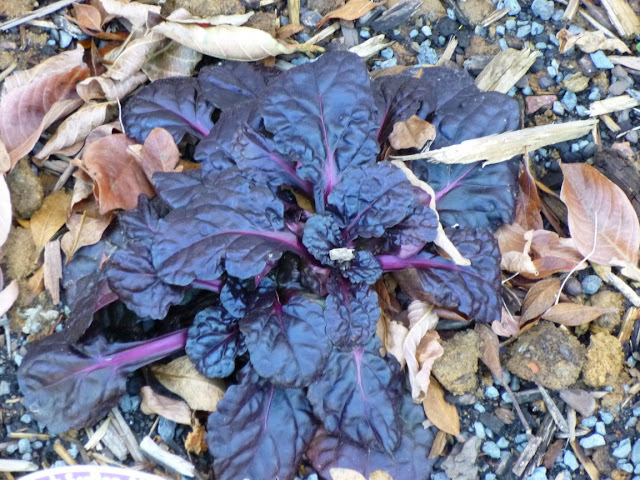 This photo does not accurately capture the beautiful black-purple glossiness of the leaves. Ajuga, also known as bugleweed, has been one of the toughest and most reliable perennials that I installed this past year. 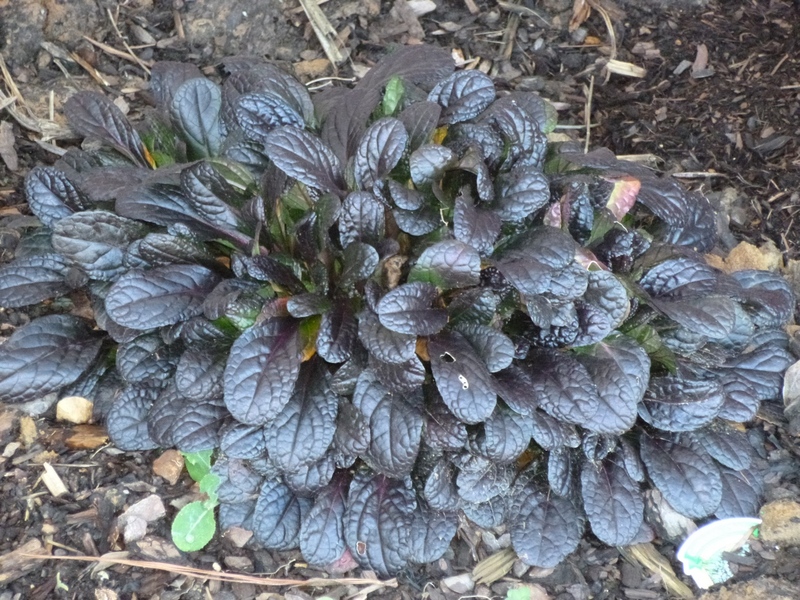 My Black Scallop Ajuga reptans didn't even blink in the 100+ temps we had last summer and it is supposedly hardy down to zone 4 so I'm guessing it should sail through out zone 6/7 winters without any worries. Ajuga comes in lots of flavors. I added a couple of green Ajuga genevensis plants a few months ago that are supposed to have lovely blue flower spikes in the summer. We shall see... So far, they're pretty mousy, but I will stay hopeful and optimistic unless proven otherwise. I've also got some small variegated ajugas (I think they are "Burgundy Glow") that I planted around the same time as the genevensis. They were on sale at the nursery and quite affordable, so I thought the risk was low. They haven't grown much since, but they haven't died either, so again, staying optimistic with those. I'm hoping that if they do grow and expand, their variegated and creamy foliage will make an interesting contrast in the border. Actually, Black Scallop Ajuga is supposed to have fragrant dark blue flower spikes too. The plant had a few spikes when I planted it last spring (though I don't recall any fragrance). Hoping for a better flower show this year now that the plant has settled in. There are reports that Ajuga reptans varieties (like Black Scallop) can be invasive, but I can't see how that could be the case. The plant expands, but grows so slowly that I feel as though it shouldn't be too hard to keep it in bounds. That said, I can see how it might crowd out any shy neighbors planted nearby. Supposedly, the only real danger with Ajugas is crown rot, which can occur in poorly-drained soils. I definitely have drainage concerns with my heavy clay soil, but my Ajugas (especially the largest one) are planted in some fairly heavily amended landscape beds, so I hope they'll be OK. There are lots of different kinds of Ajuga out there. Presuming that I have good experiences with the ones I've already planted, I hope to add others to my gardens down the road. A second Black Scallop Ajuga that I planted this autumn. 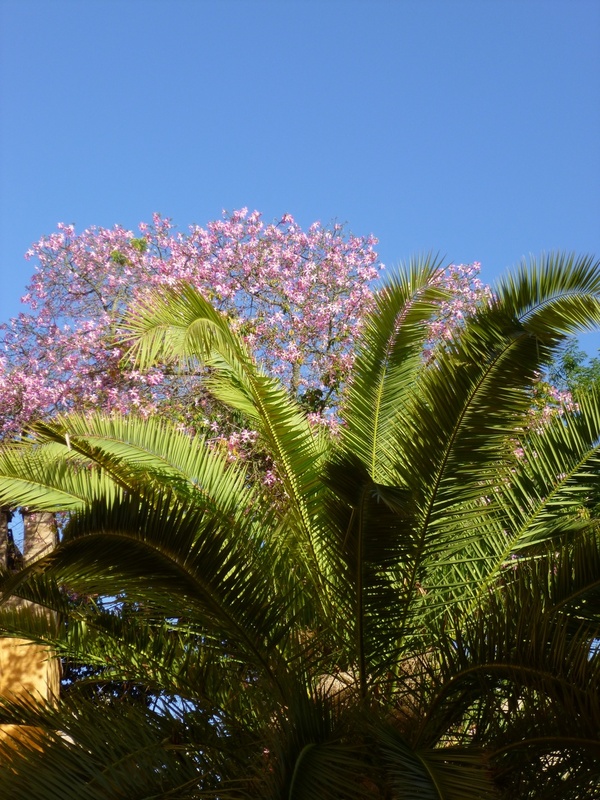 The rich purple coloration of the leaves comes across better in this photo. 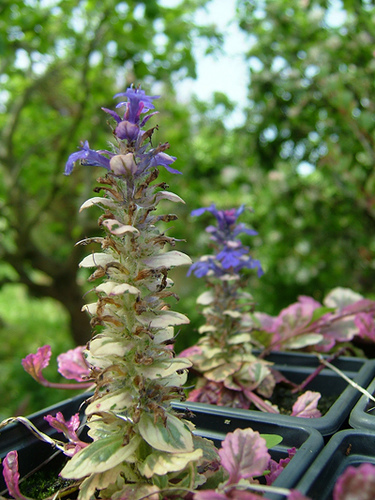 Do you grow Ajuga? And if so, have you ever had to divide the plant? goGardenNow says you need to divide at least every three years to prevent crown rot. At least Garden Splendor says it's easy to divide simply by digging up, pulling it apart into fist-size clumps and replanting. Yardener just suggests thinning out an Ajuga planting if the bed has become overcrowded, which I suppose makes sense. 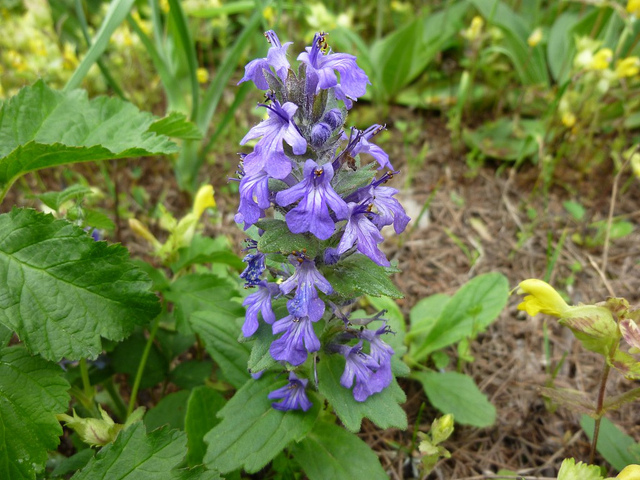 I've also read conflicting reports as to whether Ajuga is edible or poisonous. 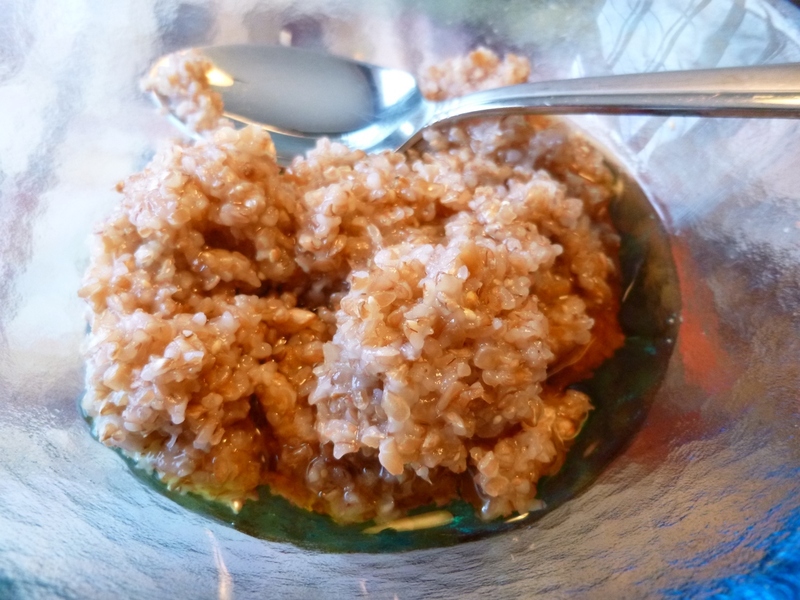 Until I figure that one out, I'll be erring on the side of caution with a look-don't-taste approach! Will my ajugas continue to thrive in 2013? Follow their progress with free email updates! 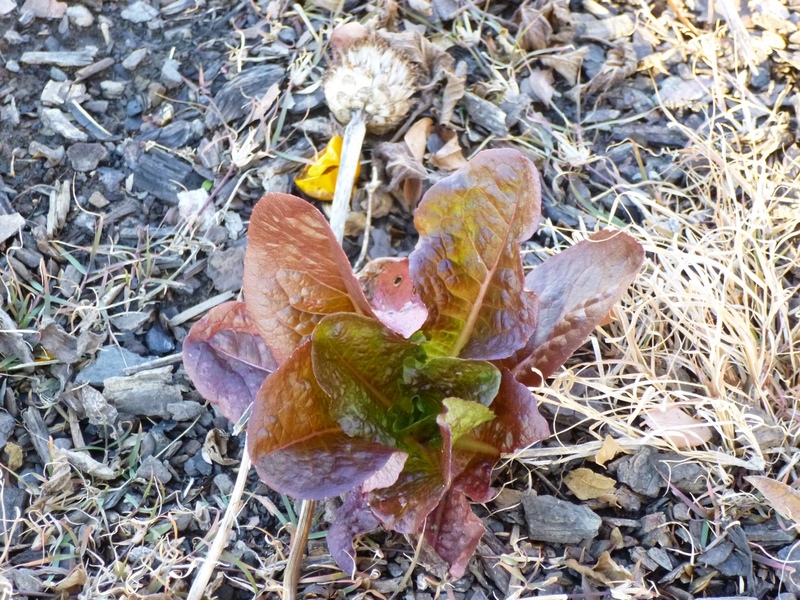 A bright splash of gold on green leaves adds warmth and cheer to even the coldest December day. I'm feeling pretty happy about this evergreen Aucuba that I planted just a couple of months ago in the shadiest corner of my front foundation border. 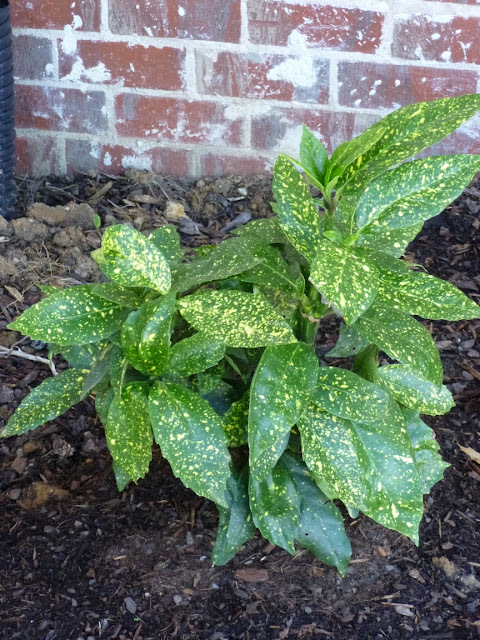 North Carolina State University has a nice profile on Aucuba japonica (hardy to zone 7) and a description of more than half a dozen cultivars. This little guy is only 2-3 feet tall right now, but I hope in time it will develop a commanding presence if it reaches its projected adult size of 4-6 feet tall and wide. Curious to see how the Aucuba will fare? Get all the latest Garden of Aaron updates with a free and easy email subscription. Who says that the December garden has to be bare and brown? Today and over the next few weeks, I plan to post photos from my December garden rich with a variety of colors and textures. Most striking are the camellias - three that I inherited and two more that I purchased and planted this autumn. The ones that I planted are called Kanjiro and the too-cutely named Pink-a-Boo. 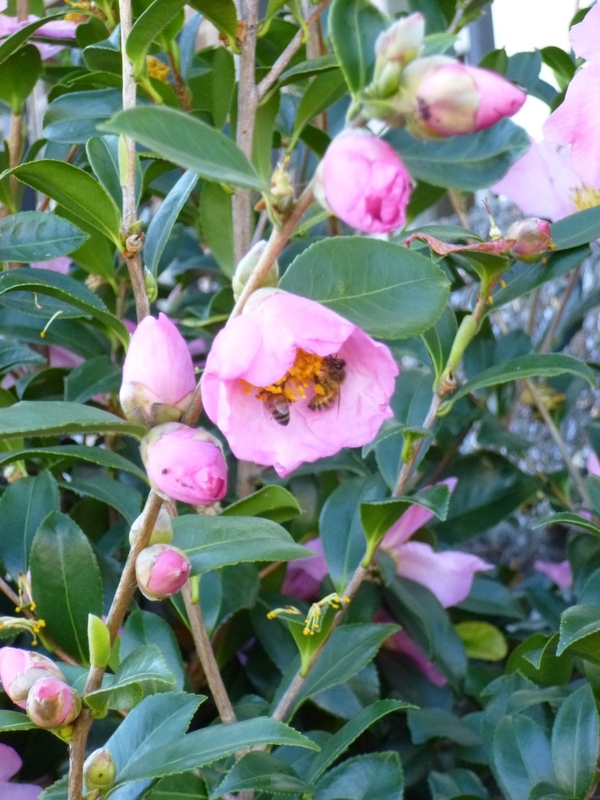 I don't know the names of the varieties that were here when we moved in -- which is too bad, because I would love to know the name of the pink camellia that is now adorned with dozens of flowers and a buzzing crowd of bee admirers. The two new ones (not surprisingly) have fewer blooms, but they seem to be settling in nicely. - Can cope with many different soil types. - Surprisingly drought-tolerant once established. 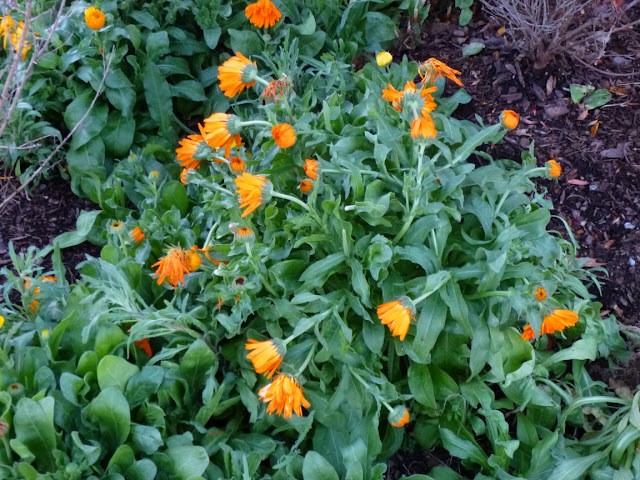 - Generally hardy to at least zone 7, with newer varieties potentially hardy even further north. 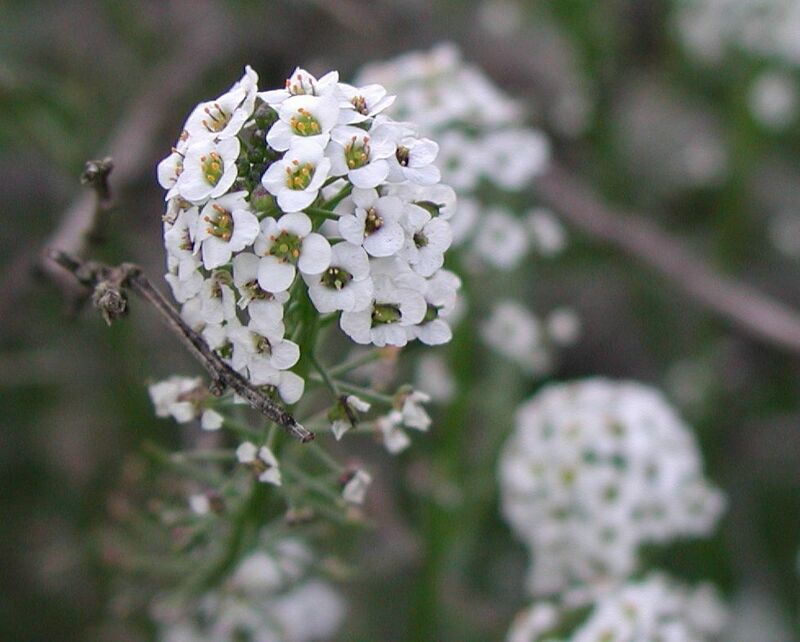 - Low-growing varieties can be used as a groundcover on steep hillsides! (I have to confess that this idea never occurred to me.) Taller varieties can be used in mixed hedges or as specimen plants. Mine are in the front foundation planting. 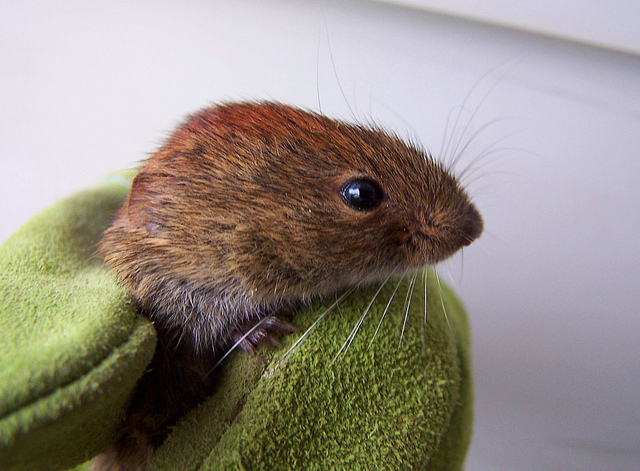 - Small specimens are inexpensive and readily available. - Virtually pest-free and can survive periods of neglect. Sounds like a tough and versatile plant, which I admire. As far as I know, there are no concerns about it being invasive, which of course can be an issue with exotic plants like Camellia sasanqua, which comes from Japan. But despite all of these points in its favor -- and despite the fact that the flowers add beautiful color to the winter landscape and presumably provide much-needed food for bees and other insects at a time when little else is blooming (well, besides by English Marigolds), I have not seen a single other camellia while walking around my neighborhood. 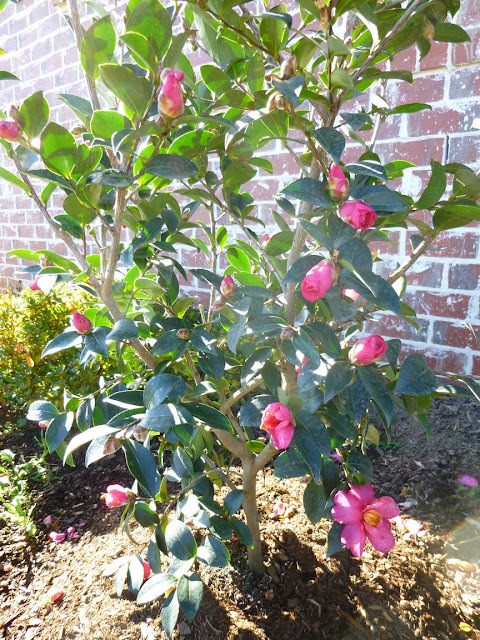 Do you grow camellias in your garden? If not, is there some reason you avoid them? Or have you just not considered them to this point? Note that despite Floridata's glowing endorsement and my own happy experiences with Camellias thus far, I do understand that almost every plant has its weaknesses or drawbacks. Clemson University, for instance, offers a more nuanced take on camellias with a description of several diseases and pests that can attack the plants. Yet there are many other plants equally or more susceptible to damage and decline that are widely planted in the Middle Tennessee landscape, and I would argue that Camellias unique attributes - its glossy green evergreen leaves, its long season of beautiful blooms in the fall and winter stretching over weeks or even months, its clear attraction for the bees that so desperately need sources of pollen in our suburban landscape -- all of this should encourage homeowners to give camellias another look when considering new plants for the garden. 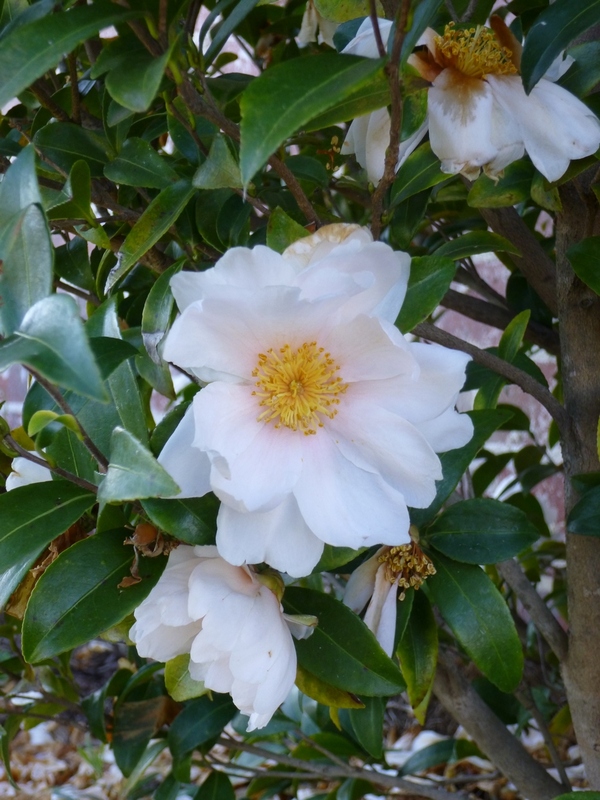 Personally, in my own garden, I have not noticed many problems on the two established camellias. There were some occasional problems with leaf yellowing last year, which I thought might have been due to alkaline soil issues, since I believe camellias prefer more acidic growing conditions. So I added a bit of organic Espoma acidic fertilizer to the soil in the fall and both plants look healthier than ever with far more blooms this year than last. 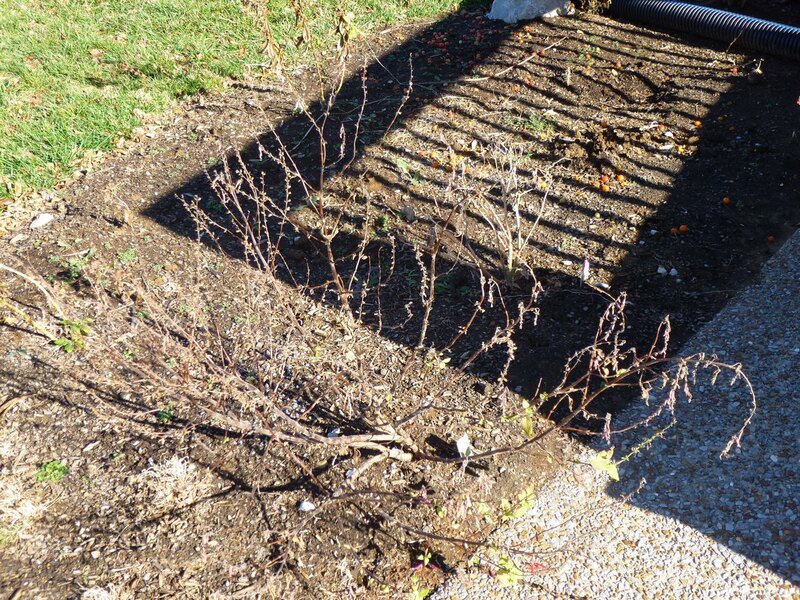 1) Freezing weather does not seem to damage those buds that are tightly closed, but temperatures in the 20s (like those we had last months) may kill those flowers that are already blooming or buds that have already partially opened. In our case, the cold snap only lasted a week or so. When the weather warmed up, I just picked off the dead flowers and new ones from undamaged buds soon started blooming again within a few days. 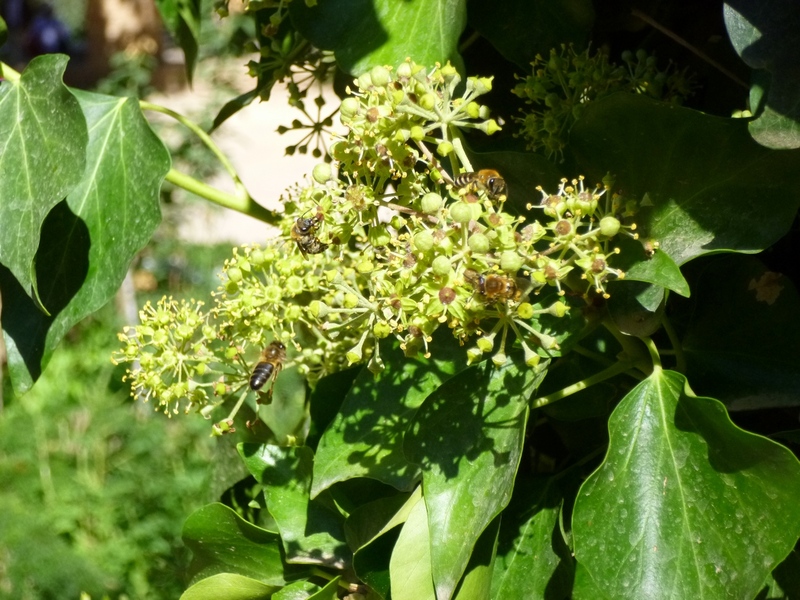 2) As with many other types of flowering plants, it has been my observation that the bees tend to prefer visiting the simple, open and accessible flowers over the highly-ruffled "fancier" types of blooms. This seems to make sense intuitively. If I were a bee, I imagine that I would go straight for the accessible pollen too rather than trying to fight my way through a maze of petals. Yes, I am blatantly anthropomorphizing. 3) There seems to be quite a lot of variation among the camellias in terms of the extent to which dead flowers persist on the plant. As I've mentioned in earlier posts, deadheading flowers is a pet peeve of mine. 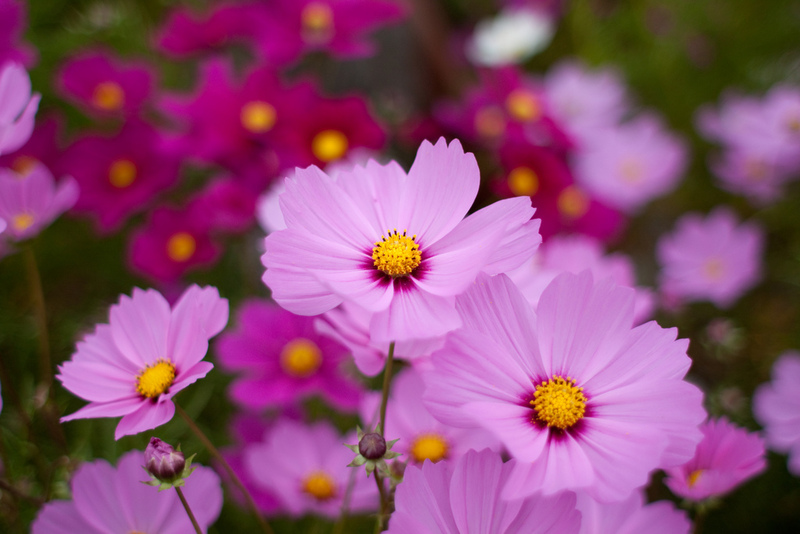 Therefore, I tend to prefer plants where the old flowers either fall off, are hardly noticeable or even attractive (as with coneflowers, sunflowers, Autumn Joy sedum, etc.) My highly unscientific observation would be that the camellias with simple flowers tend to be a bit better in this regard, with the individual petals falling off and making a pretty carpet on the ground. By contrast, the ones with more complex flowers seem to hang on the plant longer to the point where even I am compelled to do some deadheading. 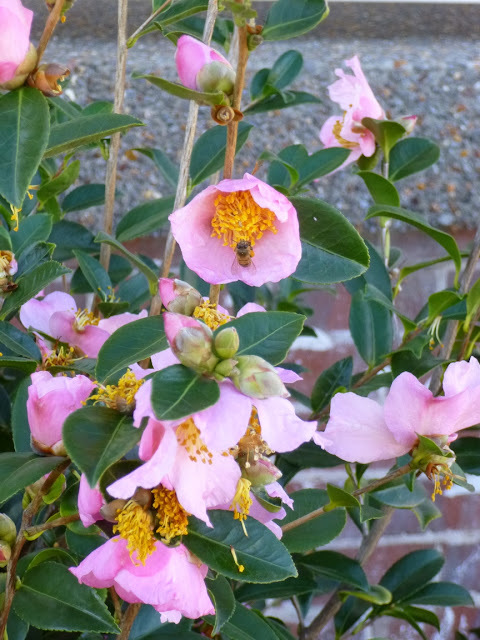 So for this reason - plus out of consideration to the bees - I do think I will try to plant camellia varieties with simpler flowers in the future. 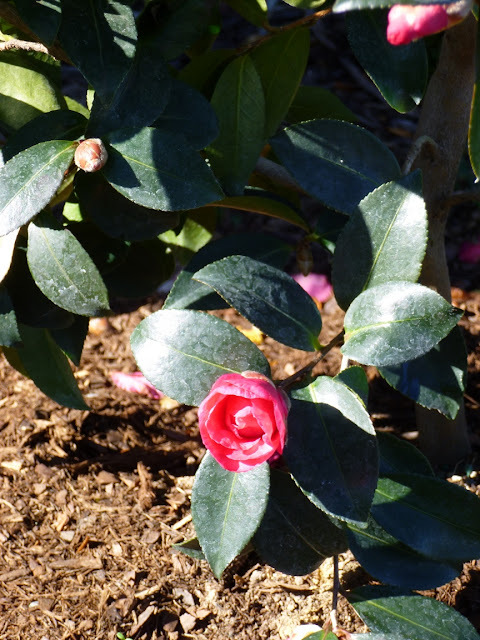 4) Camellias can reportedly live for a very, very long time. There is something nice and noble, I think, in the notion that a gardener could/should seek to leave a legacy for the next generation. Well, there are reportedly camellias living in Europe that are over 230 years old and I'd imagine that there are probably camellias in Japan that are even older than that. So if you plant and nurture a camellia today, you could be "paying it forward" and giving beauty and pleasure not just to the next generation, but to many more generations to come. Eager to see how these camellias perform in 2013? Want to see the blooms from the one camellia bush that is still just covered with buds (not shown here)? 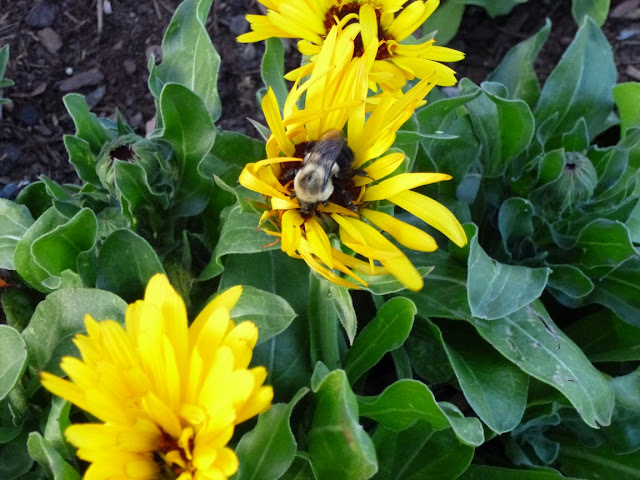 Even the busiest bee can stay in the loop with free email updates. Plans and Dreams #2 - Looking Ahead to 2013! Yes, I know it is only November 12th, but as my father says, "Dates on the calendar are closer than they appear." So what do you think of these selections that I'm planning to plant in 2013? 1) Lobularia maritima, Sweet Alyssum - Planning to heavily wintersow actually by buying seeds in bulk. 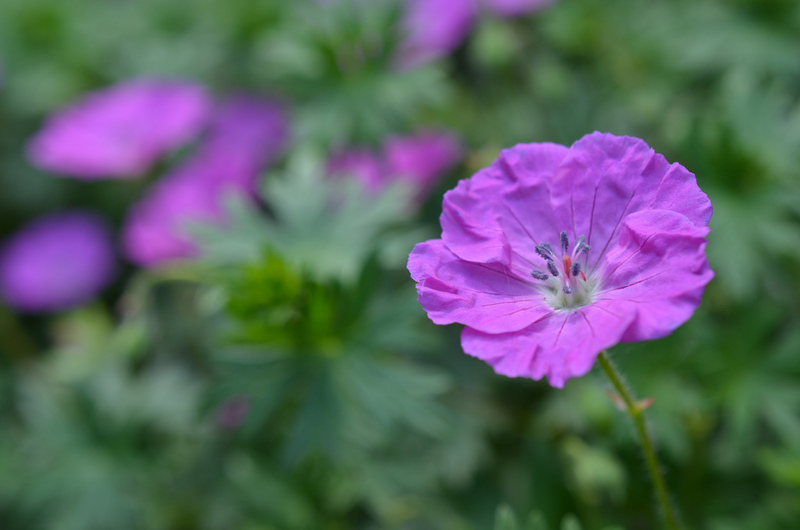 5) Geraniums - I'm probably going to go a little overboard with the perennial geraniums next year. I've enjoyed having Rozanne in my garden for two years now and I'm eager to experiment with some other varieties -- hopefully ones that will spread into groundcovers. Rozanne bloomed beautifully in full sun during the springtime, but it quickly faded and baked during the summer, so I moved it to the front foundation bed where it will get afternoon shade. That's where I plan to put the others - Karmina (G. cantabrigiense) and Max Frei (G. sanguineum) from Romence Gardens; Biokovo (another G. cantabrigiense), Bevan's Variety (G. macrorrhizum) and Claridge Druce (G. oxonianum) from Gardens in the Wood of Grassy Creek. 6) Hibiscus syriacus "Diana" - I ordered the blue Rose of Sharon ("Blue Bird") from Gardens in the Wood of Grassy Creek last month. I had wanted to get Diana too, but they were sold out until next spring. 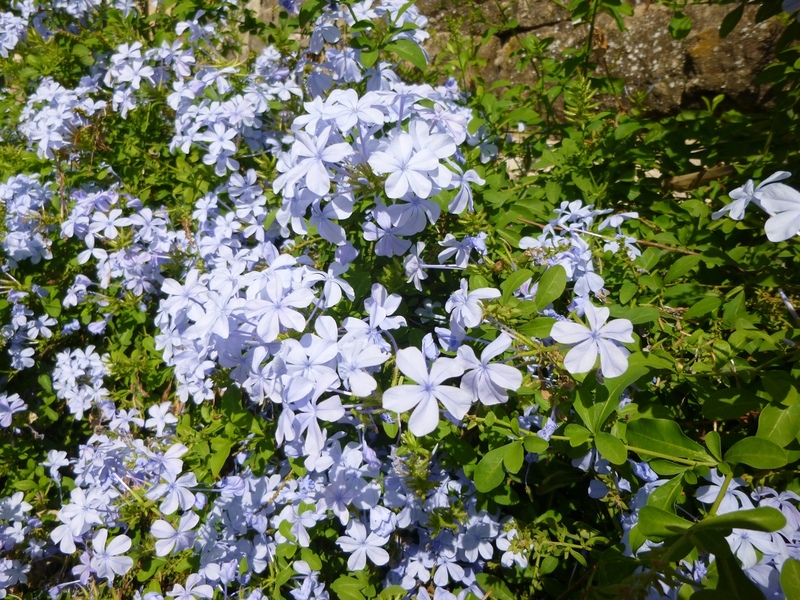 Like Blue Bird, Diana is supposed to be a sterile cultivar without the excessive self-sowing issues that can reportedly be a problem with some Hibiscus syriacus varieties. 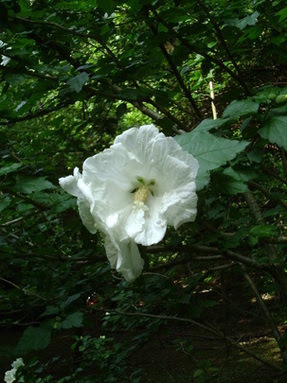 "Diana" Rose of Sharon (Hibiscus syriacus), photo courtesy of Gardens in the Wood of Grassy Creek. (I had another white hibiscus with a red center previously pictured here that I had found labeled as "Diana" on Flickr, but Dottie at Gardens in the Wood was kind enough to let me know that Diana is a pure white hibiscus and to let me display the photo from her website in this blog post. 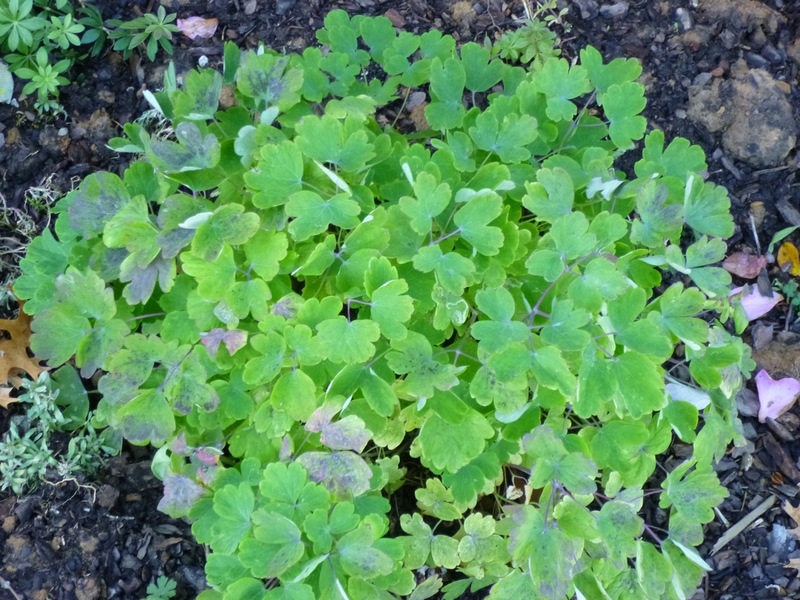 7) Aquilegia, Columbine - Yes, I just wrote that I was "on the fence" about aquilegia (or at least the "Winky" ones I've got, which I believe may be sterile). Part of the fun of Aquilegia, it seems to me, is that it should self sow! 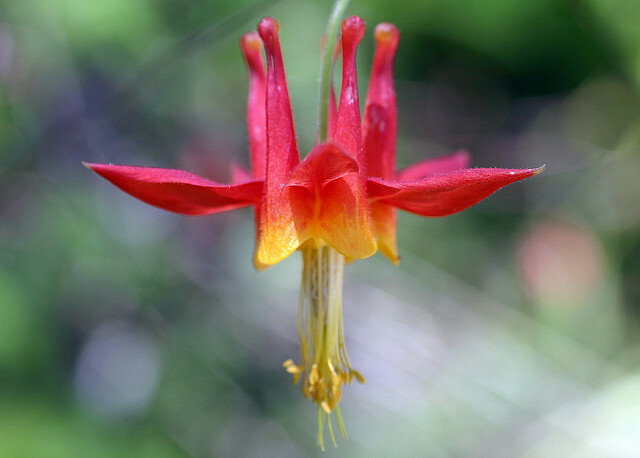 So I think I'll try the Aquilegia canadensis and vulgaris from Gardens in the Wood of Grassy Creek next year and then hope for lots of volunteers the year after that! 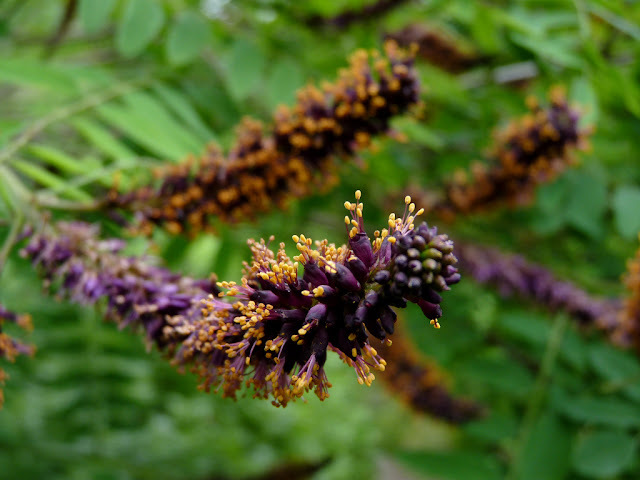 8) Amorpha fruticosa, False Indigo, Indigo Bush - Supposed to be a tough sun-loving native that fixes its own nitrogen and can tolerate windy sites. Sign me up! Oh and did I mention it is supposed to attract butterflies too? This will be my first attempt at bare root planting, via Prairie Moon Nursery. 9) Forestiera neomexicana, Desert Olive - Reportedly tolerates drought, heat and clay soil while growing anywhere from 6 to 18-feet tall and 12-feet wide. As a bonus, it is also supposed to have nice fall color. I'm planning to get mine from Woodlanders. (I have to admit I'm a little concerned about whether the soil drainage here is good enough for this plant, since it's really native to SW deserts, but I'll probably give it a shot regardless. High Country Gardens seems to think it can handle clay.) 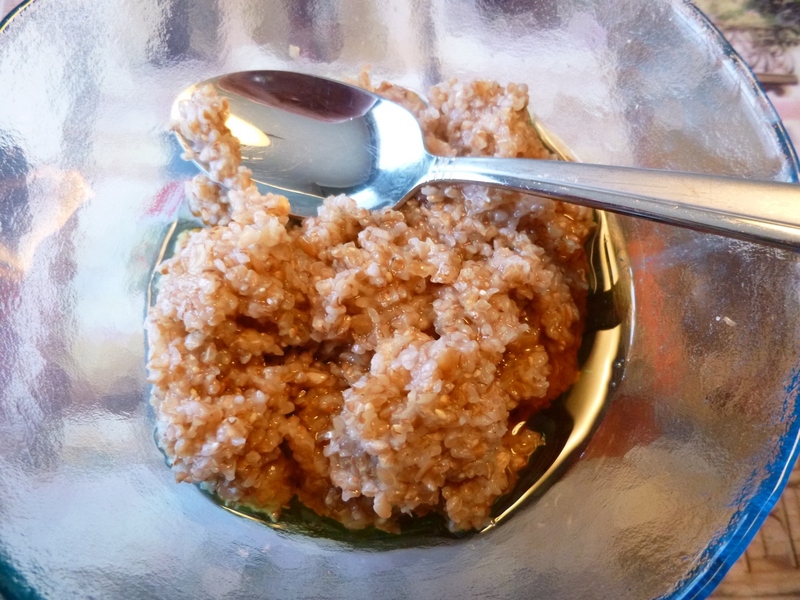 There are sources on the Internet that suggest the berries - which you need both male and female plants to produce - may be edible to people, but not very palatable. 10) Agastache foeniculum, Anise Hyssop - Supposed to attract bees and butterflies, supposed to self-sow too. I didn't have any luck growing this from seed this past spring, so I eventually bought a golden anise hyssop cultivar at a local nursery and planted it in partial sun a couple of months ago. 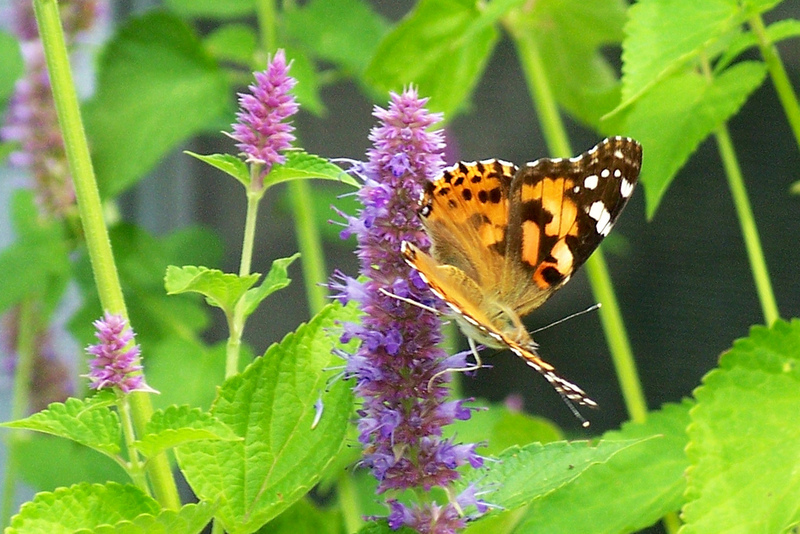 But I think anise hyssop really needs full sun. Maybe I'll try transplanting the golden one and then buying a new species plant from Almost Eden. Again, I'm a little worried about drainage with this plant, but I think I'll give it a shot. Even if it does not overwinter, hopefully I'll get lots of volunteers! 11) Borago officinalis, Borage - This annual flower is supposed to be very attractive to bees. 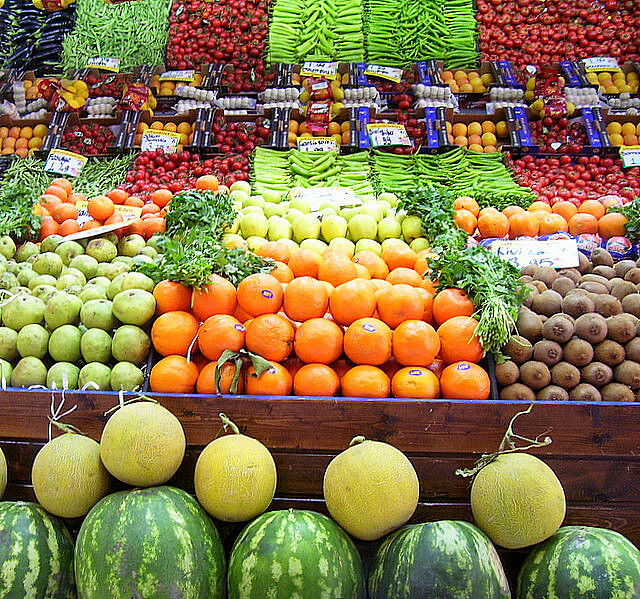 Other selling points - drought tolerance and an ability to repel some pest insects. I plan on buying my seeds from Seed Savers. 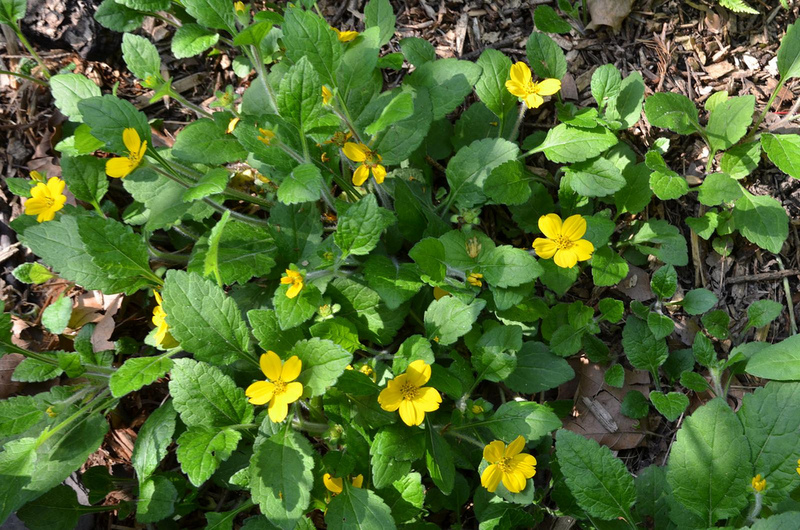 12) Chrysogonum virginianum, Allen Bush, Golden Star, Green and Gold - I continue to look for groundcovers that are vigorous, but not exotic invasives. Allen Bush is supposedly a good ground cover for shady spots in the South. I plan to buy a couple specimens from a local nursery or Almost Eden. 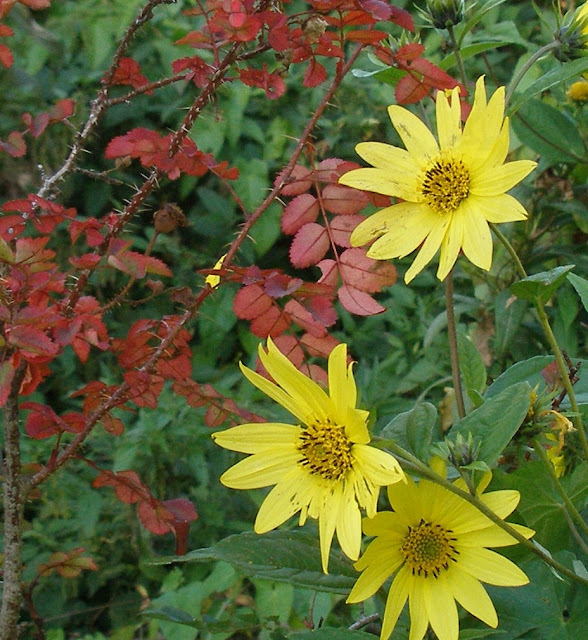 13) Helianthus microcephalus, Small-headed Sunflower - Yes, it's another sunflower! 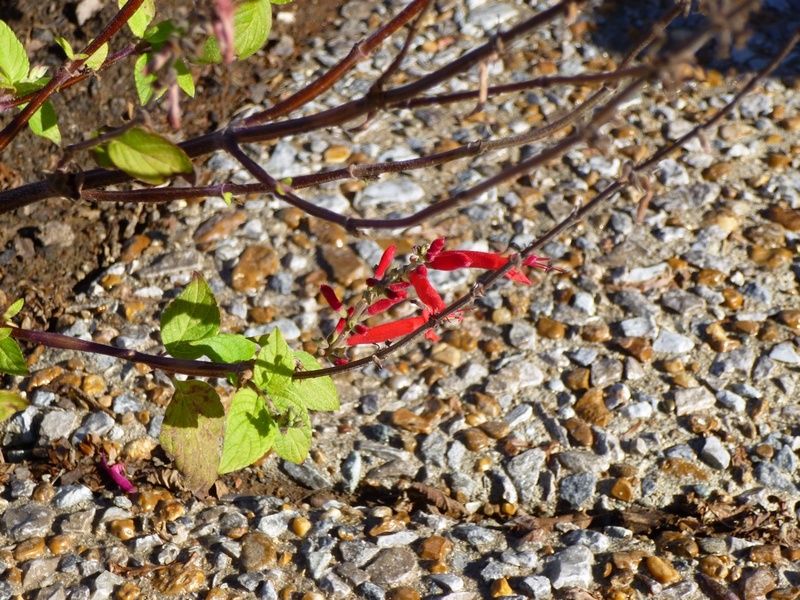 This one is a perennial that is hardy to zone TK, and thus should survive in my Middle TN garden. Should make a statement if it reaches its projected size (5 to 8-feet tall by 3-feet wide). I plan to buy the "Lemon Queen" variety from Gardens in the Wood of Grassy Creek. Should hopefully attract bees and butterflies! 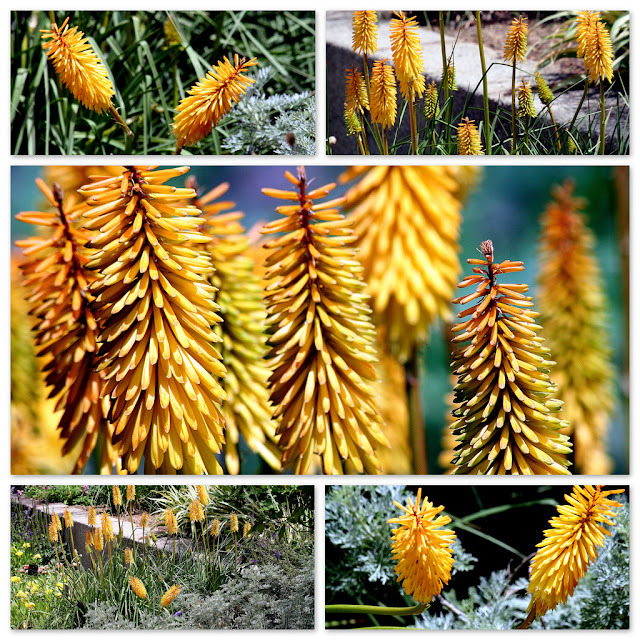 14) Kniphofia uvaria, Red Hot Poker, Torch Lily - Highly recommended by an accomplished gardener in Tennessee, I'm looking forward to trying my hand at growing Torch Lily. I'm a little worried about drainage issues here too, but I'll try amending the hole at planting time and hope for the best. I'm planning to order an "Earliest of All" Kniphofia from Edelweiss Perennials in the spring. 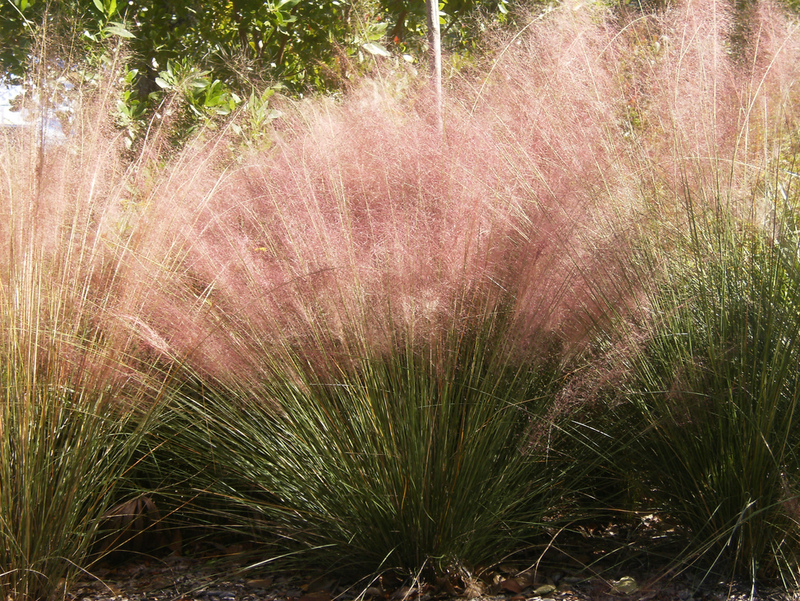 15) Muhlenbergia capillaris, Pink Muhley Grass - I've seen some of these around in the neighborhood and I like the floating-pink-cloud look and the fluffy texture. My plan is to order 2 or 4 of the "Lenca" variety from a local nursery and use them to frame the entrance from our back to patio to the yard. 16) Ratibida pinnata, Grey-Headed Coneflower - Another North American native that supposedly tolerates heat and drought, self sows, and attracts butterflies, bees and birds! Once again, drainage could be an issue here, but I'll try amending the soil at planting time and hoping for the best. I anticipate purchasing Ratibida from Romence Gardens. 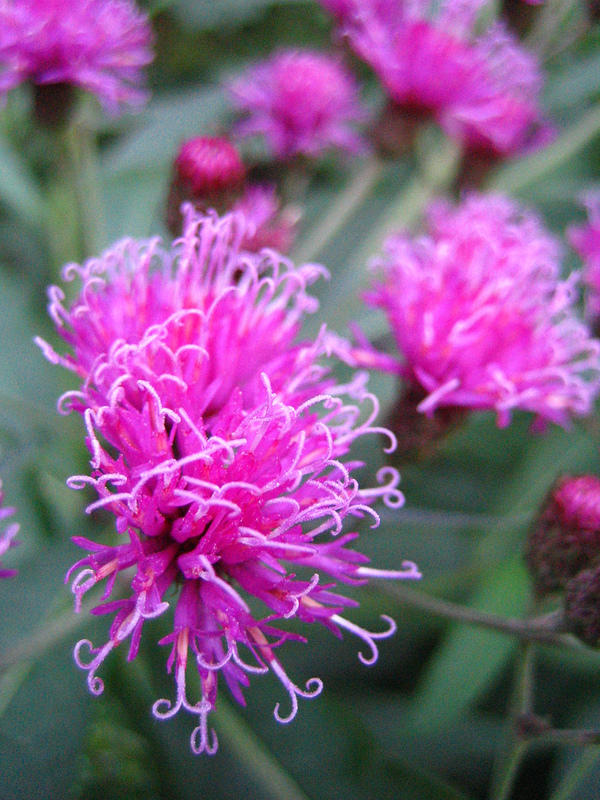 17) Vernonia noveboracensis, Ironweed - Yep, the name says 'weed', but I still think it's beautiful. 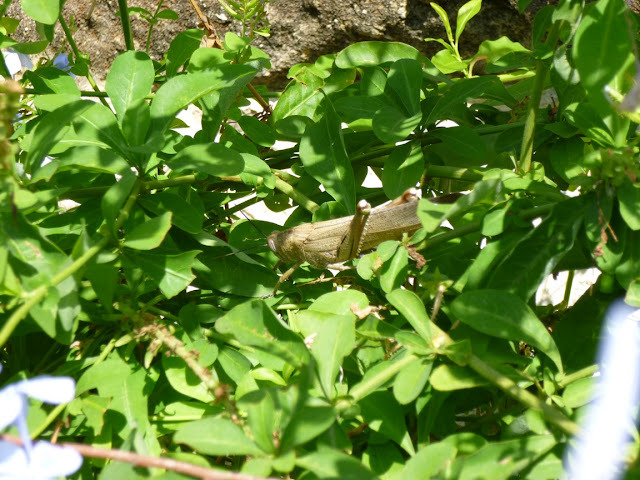 Supposed to tolerate drought, heat and humidity, while attracting butterflies. I plan to purchase this plant from Gardens in the Wood of Grassy Creek. Want to see how all these plans play out? Find out with a free email subscription.